Tsehai Makes Friends in 20 Schools! With the assistance of our crowdsourcing campaign, WKW equipped 31 classrooms in 20 government-run primary schools around Addis with Tsehai Loves Learning Corners filled with Amharic flashcards, posters, storybooks and workbooks. In total, WKW distributed 6000 student workbooks. 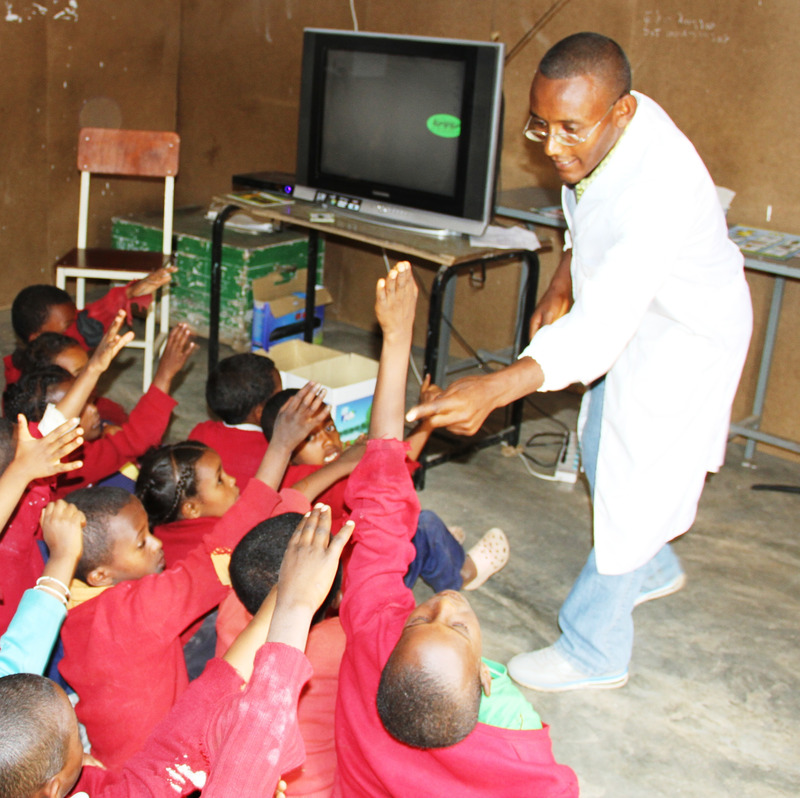 Each school received a Tsehai-themed reading corner, the new Tsehai Loves Learning season, and a DVD player. To ensure that these products are used properly, WKW provided in person and DVD training and dedicated a literacy coach to support the schools during the academic year. The Reading Corner is designed to increase the literacy by developing a love for reading. After distributing the Reading Corner, WKW returned to see how the students enjoyed these resources. At Wetatoch Genet Primary School, a substitute, Bezabih, was teaching. While Bezabih is an experienced Amharic teacher, Tsehai was new to him. He learned that the students loved Tsehai and that he loved teaching with Tsehai. During Tsehai episodes, he paused on certain fidel and words and resumed the video after students identified the fidel or words. This school illustrates how Tsehai influences the hearts and minds of students. For more stories, checkout our Facebook and Twitter. A different school is featured each weekday. WKW is able to share these success stories in part because of the generous support of the All Children Reading partners: the United States Agency for International Development, World Vision, and the Australian Agency for International Development.